The sage flats are subtly colorful, mostly with yellow, cream, and rose hues of persistent and pervasive sulphur buckwheat flowers and fruits (Eriogonum umbellatum varieties). Lupines still flourish, sage is extending its silvery flower stalks, and the grasses wave gracefully in the breeze. For fresh blooms and splashy color you have to go higher and higher. Walk through the meadows up to Ski Lake, and beyond to find flowers. 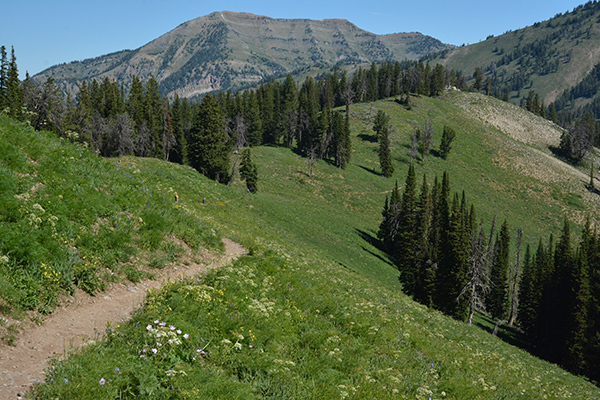 Cool canyons and high meadow slopes feature floral bouquets. What we think of as spring flowers: Spring beauties (Claytonia lanceolata) may be blooming in recently melted snow patches. 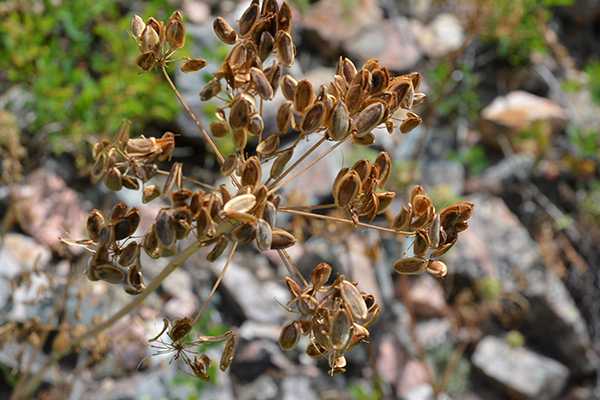 On dry slopes, late summer bloomers may be out already, such as Engelmann Aster (Eucephalus engelmannii). On any given slope, flowers will mix in different combinations of pink sticky geranium, red to yellow paintbrushes, blue lupines and asters, lavender erigerons, yellow sunflowers, white columbines, to name a very few! Mid-elevation hikes are good for botanizing. 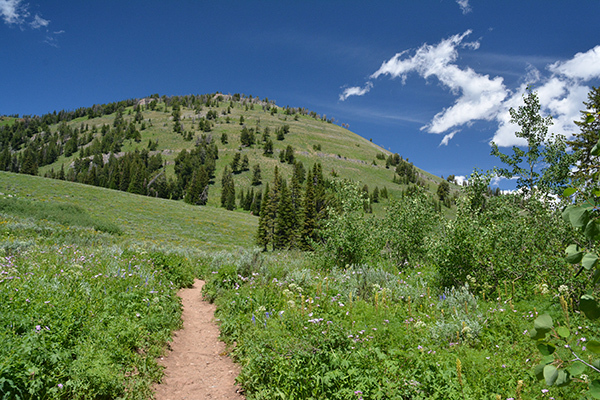 Trails south from Teton Pass and north to Ski Lake exhibit extraordinary diversity of bloom. Moose-Wilson Road and hikes to Phelps Lake are also great right now. You may want to visit Goodwin Lake, Two Ocean Lake, and other mid elevations at the north end of the valley as well. This list does not include the incredible alpine and subalpine flowers found at 9,500’ and above. 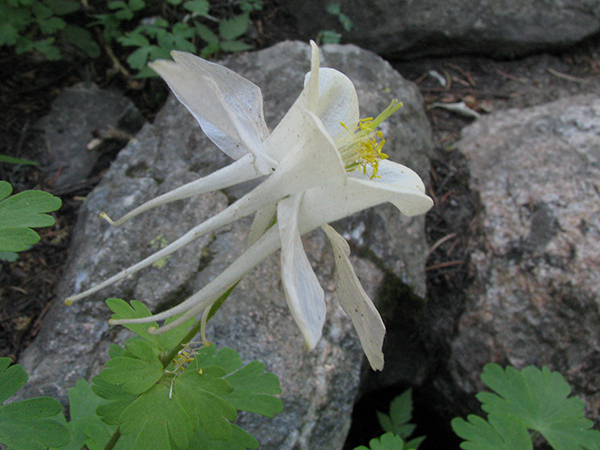 Colorado or White Columbine – Aquilegia coerulea var. ochroleuca– The delicate “talons” or spur-like petals extend 2” beyond the rounded sepals (which look like petals) and contain nectar for long-tongued pollinators: hummingbirds and hawkmoths. 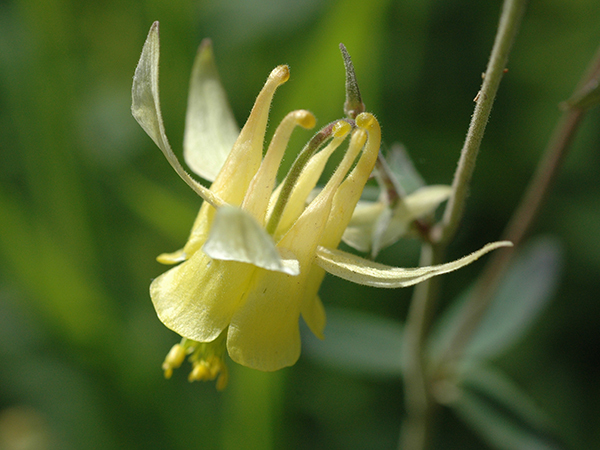 Not to be confused with the lemon-yellow to bluish color Yellow Columbine (Aquilegia flavescens) which flexes shorter, stubbier spurs. Long-tongued bees are more likely pollinators. 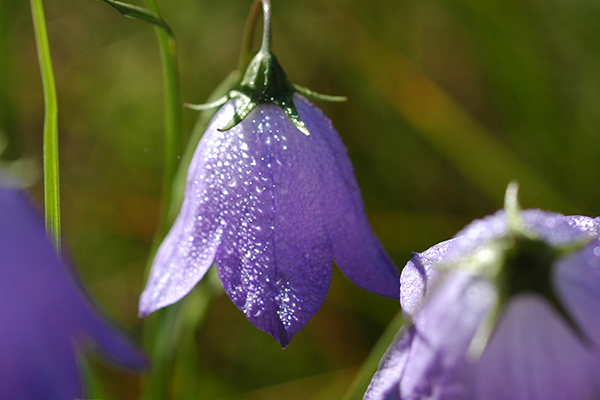 Harebell – Campanula rotundifolia – The dangling blue bells are long-time favorites of locals, blooming from mid summer to the end of autumn. 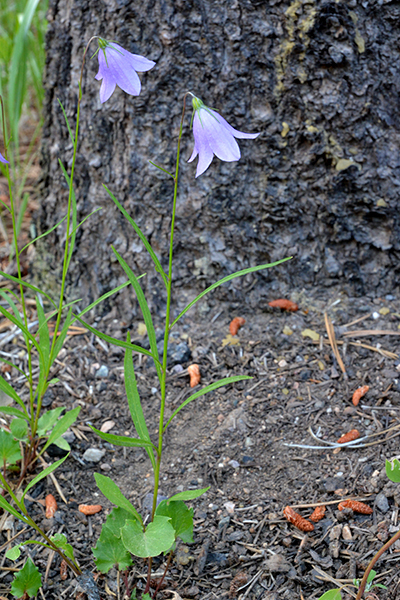 The leaves at the base are more or less round, but the stem leaves are linear in Harebell. Paintbrushes – Castilleja spp. These members of the Snapdragon family have complex flowers. Often the fused petals (galea) hide amidst colorful sepals and bracts. The species often hybridize or double their chromosomes, making it difficult to identify the species precisely. For instance, color can be highly variable. Below are samples of the more obvious and beautiful, common species. Wyoming Paintbrush – Castilleja liniarifolia – The state flower inhabits sagebrush habitat and dry slopes. 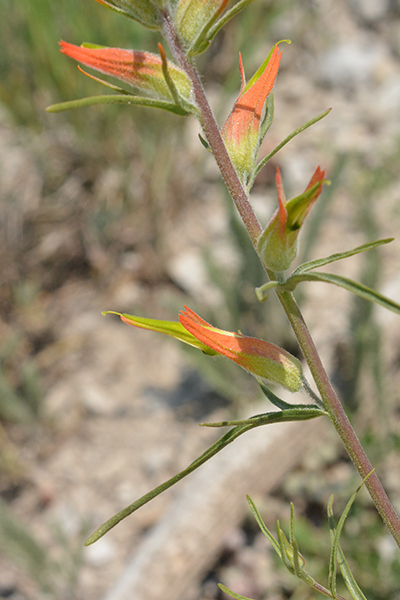 Unlike many other paintbrushes, the “galea”, the beak of fused petals, is green and sticks out well beyond the tube of colorful orange-red sepals which split deeply on the back. Colorful forked linear bracts (leaf-like structures) are held beneath each flower adding to the show. Alternating down the 2-foot stem, the leaves are thin and often forked. The plants have a wild, lean elegance. 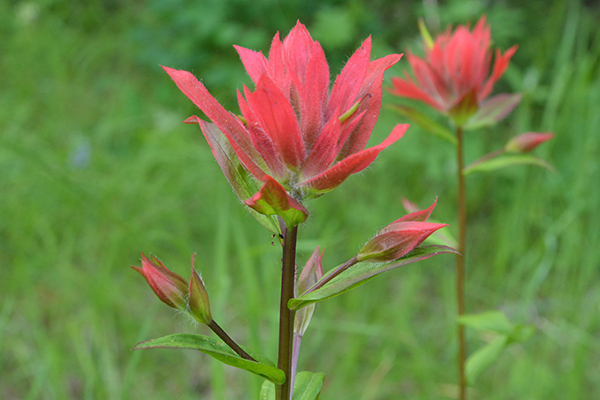 Wyoming Paintbrush – our state flower. Note the stigma sticking out beyond the flower, ready for pollen borne on the heads of hummingbirds. The green galea leans out beyond the colorful calyx tube. 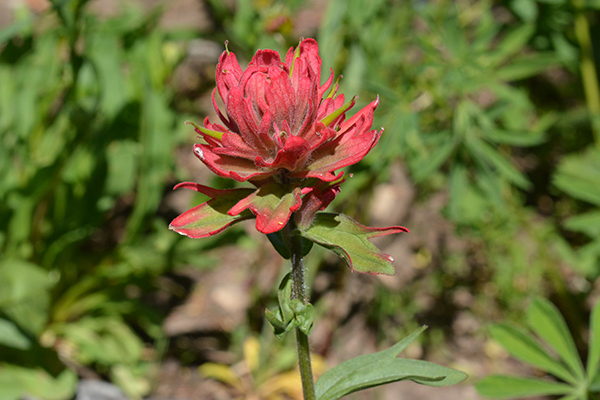 Other paintbrushes in the mountains include the Scarlet Paintbrush – Castilleja miniata. Stems are up to 3’ high. Colors vary from pink, to salmon, to whitish to scarlet. 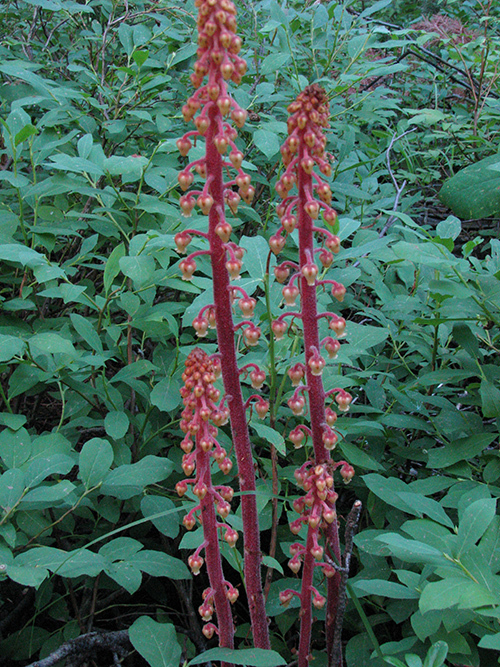 Scarlet Paintbrush is highly variable in its color. Note the leaves and bracts are not lobed. The green galea of fused petals is almost hidden by the colorful sepals and bracts. Also look for the very similar, shorter Alpine Paintbrush – C. rhexifolia – in subalpine to alpine locations. The bracts are slightly lobed at their tips. Distinction by color, unfortunately, is in the eye of the beholder. Note the lobed tips of the bracts and leaves of Alpine Paintbrush, which otherwise looks a lot like Scarlet Paintbrush (above). 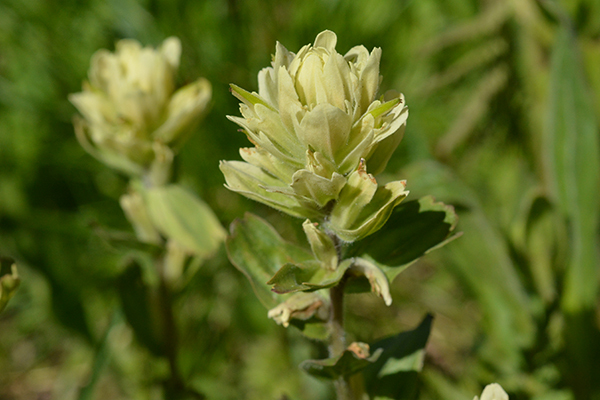 Sulphur Paintbrush – Castilleja sulphurea – The “galea” barely pokes out beyond the sepals and bracts which are both usually pale yellow (but there are color variations!) with many long, often sticky hairs. The leaves, like the bracts, are usually more or less entire, not divided. Sulphur Paintbrush can grow in multi-stemmed clusters. 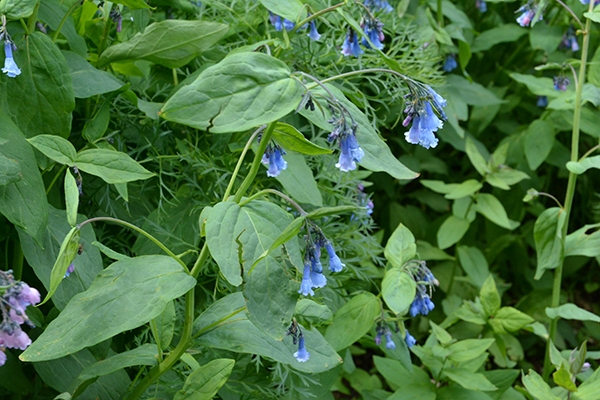 Mountain Bluebells – Mertensia ciliata – The sky-blue flower clusters drip over mountain streams at this time of year. This is the only bluebell species of this large 3-4’ size. Mountain Bluebell often grows along streams or in wet meadows. Western Sweetvetch – Hedysarum occidentalis – The violet pea-shaped flowers dangle in stiff racemes above 1’ foliage. Look for the flattened fruits that hang down in chains later in the summer. Note the “keel” and “banner” of Western Sweetvetch are longer than the side “wings” of the pea-like flowers. 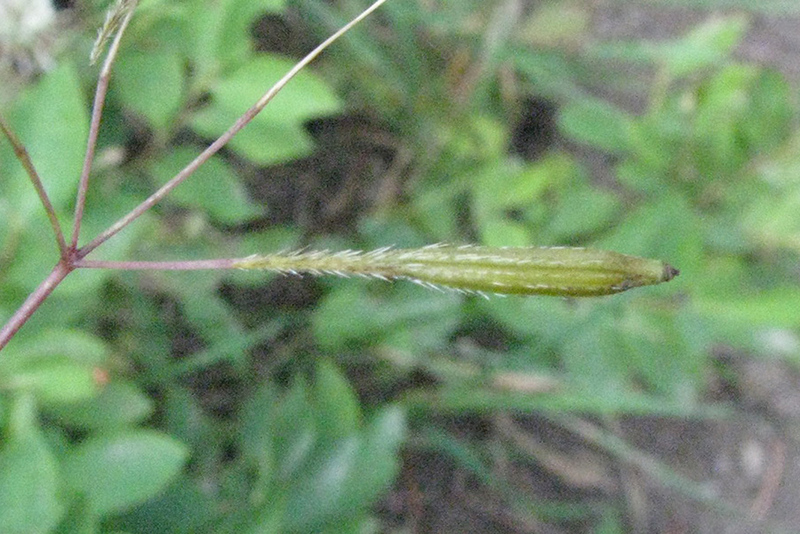 The green calyx of fused sepals at the base of the petals has uneven teeth–looking like a scoop. Mountain Hollyhock is in cool canyons and long sunny roadsides. 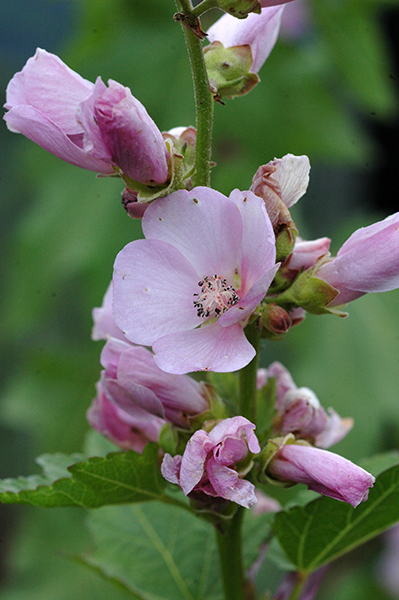 Wild Hollyhock – Illiamna rivularis – stands out along sunny dry roadsides as well as in shady canyons. The 4-6’ plants are hard to miss with their large lobed leaves and lavender to pink hollyhock-like flowers. Look inside the 1.5” petals of Mountain Hollyhock: dozens of anthers form a tube and down inside are 5 separate styles with nobs on their ends (capitate). The 1” fruits look like very hairy wheels of cheese. Each section (carpel) encloses 2 or more seeds. These features make it different than your garden Hollyhock (Malva sp). 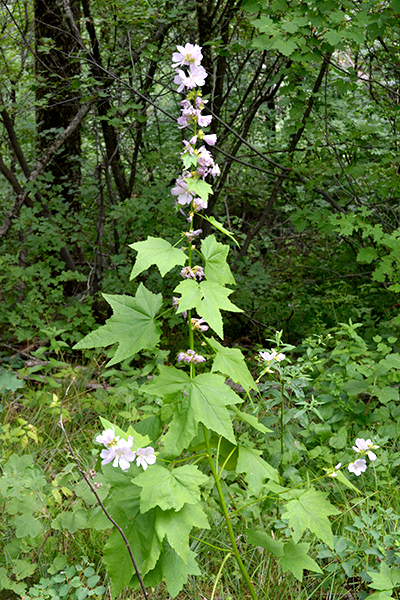 Pinedrops – Pterospora andromeda – One- to four-foot singular stalks grow in dry coniferous woods. The rusty red stems have no green leaves. Instead of photosynthesizing, the plant roots are surrounded by mychorrhizal fungi that draw upon another unknown host for carbohydrates to benefit the pinedrops. Much is still mysterious about this species. The dangling bell shaped flowers of Pinedrops will each produce a dry capsule containing 1000s of tiny seeds, easily scattered by wind deep into the duff to co-join with fungal threads. Western Larkspur – Delphinium occidentalis – Growing 5-6 feet in moist meadows, this plant has complicated flowers perfect for specific bee pollinators to puzzle out. The smart bee’s reward is nectar at the end of the “spur”. 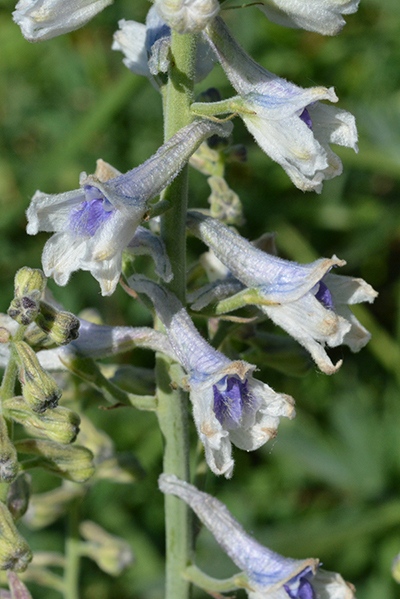 The tall Western Larkspur presents interesting puzzles to pollinators. 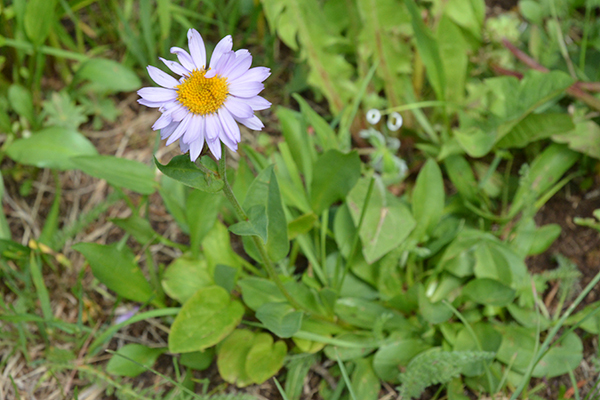 The Aster Family is one of the largest plant families in the world. The basic plan of several tiny flowers sitting on a receptacle making each cluster or “head” look like a single flower is universal. However, the variation in “involucral bracts” surrounding the “head”; the receptacle shape; outer and inner flower types—ray vs. disc; color; pappus -bristles or scales; seed shape and size are technical aspects that place “asters”, “ daisies”, and “sunflowers” into different genera. Common names add to the confusion. Regardless, it is fun to investigate the plants: Can you see similarities and differences between flowers? Pollinators know which is which, if not by name. Subaplpine Erigeron – Erigeron peregrinus – Flower heads are usually one per stem and the petal-like rays are 2-4 mm wide (relatively broad), usually bluish lavender. Plants can grow 2+ feet tall. The upper leaves may or may not be reduced. 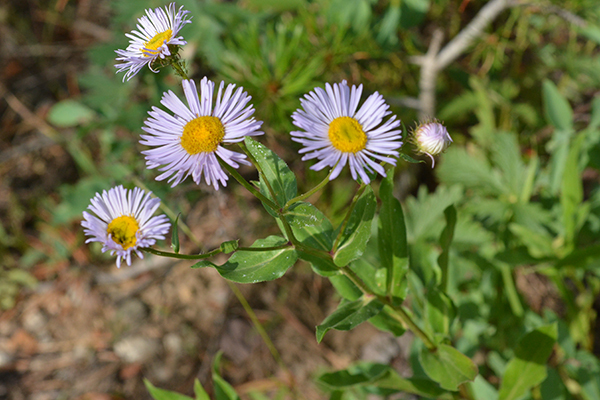 Single heads with broad, blue petal-like ray flowers are typical of Subalpine Erigeron. Oregon Erigeron – Erigeron speciosus – Rays .5-.2 mm., narrower and more plentiful (75-150) than Subalpine Erigeron. Each stem may have 1-10 flowers. Upper leaves are gradually reduced and usually egg-shaped (ovate), the lower leaves are more elongate. Leaves are typically smooth with some stiff hairs along the margin (ciliate). Oregon Erigeron has several flower heads with many small rays, egg-shaped leaves near the top, and longer leaves with side hairs near the bottom of 2-2.5′ plants. 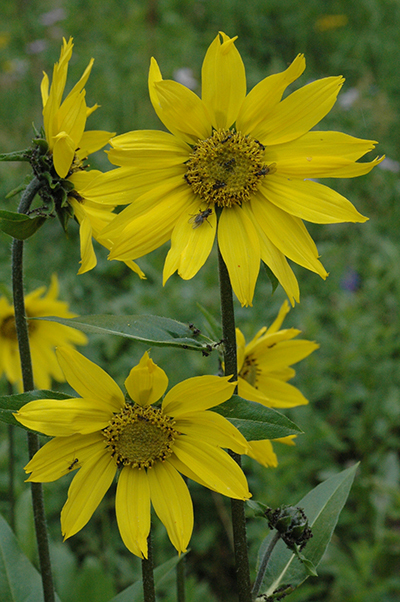 Little Sunflowers or Helianthellas – Helianthella spp.– This genus has sunflower-like heads, e.g. yellow petal-like ray flowers around the outside, and small disc flowers on the inside. The large elliptical leaves are arranged opposite near the base to sub-opposite higher on the stem. Leaves are sandpapery rough. Unlike dandelions, the “pappus” is scale-like, not fluff-like. 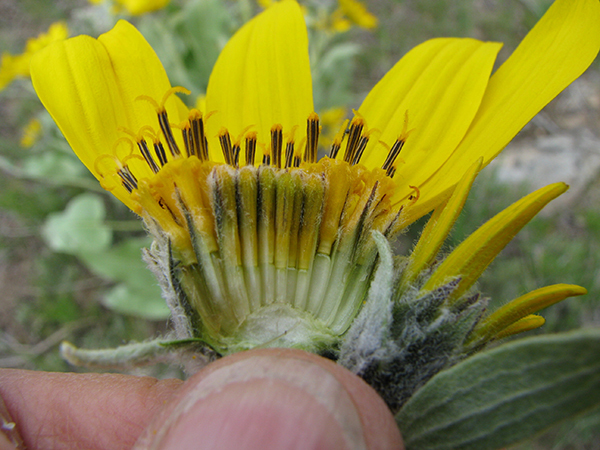 This genus has flattened achenes (frutis) with thin edges vs. not flattened of a true sunflower (Helianthus sp. –think of the sunflowers seeds you shell and eat!). Five-nerved Helianthella – Helianthella quinquenervis – stands up tall to 4 1/2’, and stares straight at you. The lower leaves may be 1’ long, with 5 obvious nerves. Basal leaves may be present. Flower heads are 3-5” across, solitary or with a few smaller below. The bracts on the back are broadly triangular and often have hairs along the outer edges. Found in moist woods in the mountains. One-flowered Helianthella – Helianthella uniflora – is shorter 2-3′ tall, and more demure in its posture. 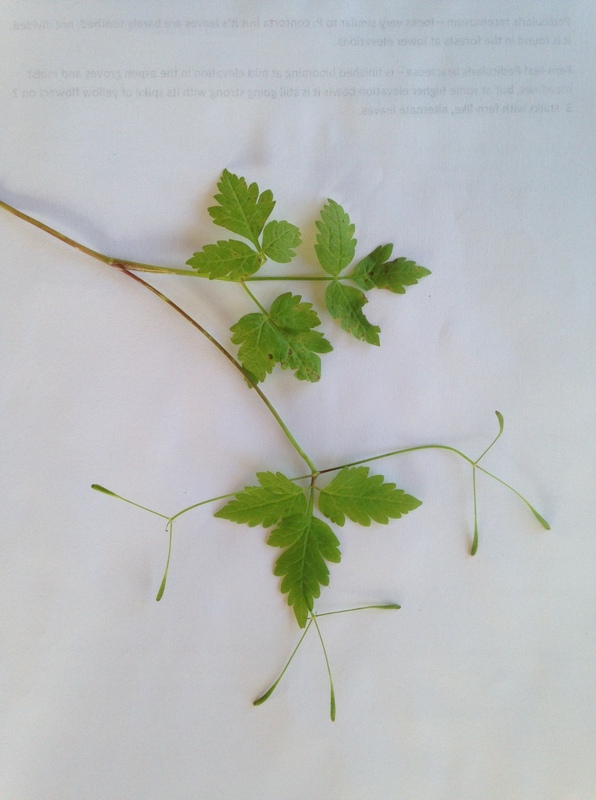 Lower leaves have 3-veins, Flower are 2-3″ across and the bracts are narrowly triangular. It grows in sage flats and up relatively dry slopes. Groundsels – Senecio spp. – This genus has yellow ray flowers plus disc flowers. The involucral surrounding each flower head is made up of one row of narrow, equal bracts, like a palisade fence. (Occasionally, a few smaller bracts can be seen at base.) The plants are typically smooth or cobwebby, never rough with stiff hairs as in look-alike sunflowers or sticky-hairy as in arnicas. The silvery white pappus (fluff) gives it its Latin name Senecio meaning “old man”. The following three species are large, leafy, and common in the appropriate habitat. Groundsels have a single row of even-sized bracts surrounding the flower heads. This is Thick-leaved Groundsel or Senecio. 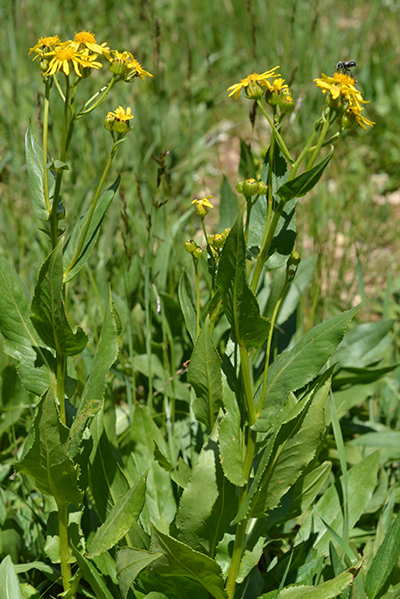 Toothed Senecio or Butterweed Groundsel – Senecio serra – The large leaves are linear or lanceolate, with pointed tips. The margins are saw-toothed. Plants grow to 4-5 feet, with multi-branching, rounded clusters of flowers. Common in meadows along open areas of Moose-Wilson Road and elsewhere. 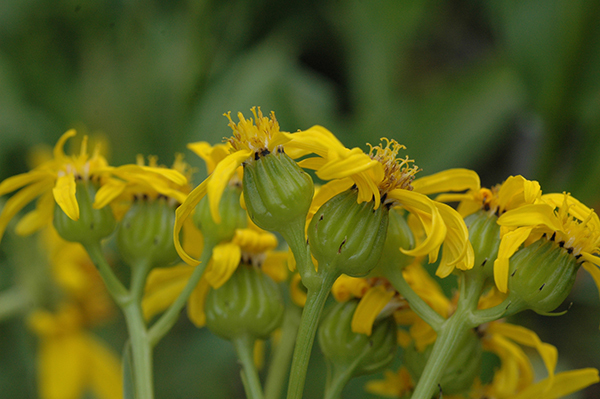 Butterweed grows in large colonies along Moose-Wilson Road. Thick-leaf or Bracted Senecio – Senecio crassulus – Smaller than the Toothed Senecio, this species is approx 2’-3 tall, with thickish leaves often rounded near the base. They alternate up stem. Edges smooth (entire) or with very small teeth. Involucral bracts are thickened, waxy, with black tips. 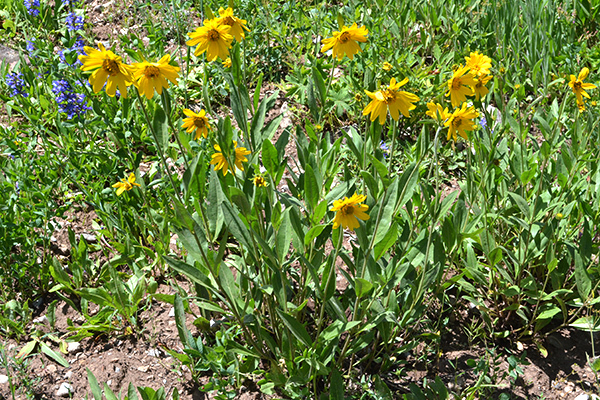 Seen in high elevation meadows. Thick-stemmed groundsel height varies but can be 4′ tall in moist areas. The leaves are usually toothed, often broad at base and clasping the stem. Goldenrods do not cause hayfever. The pollen is too heavy to be carried by wind. 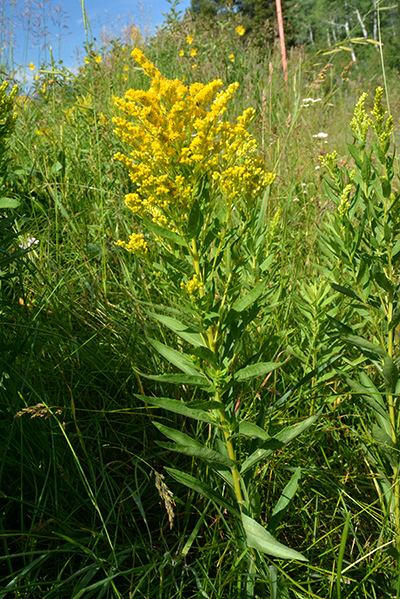 Goldenrods – First, goldenrods are not the cause of hay fever. Their pollen is way too heavy to be tossed on the wind and up your nostrils. Strong bees and flies are needed to carry pollen, it is so heavy. These pollinators are attracted to the yellow clusters of flowers. Look closely. The flower heads are tiny: 1/8-1/4” wide. Each of these flower heads has both yellow ray and disc flowers. Often these tiny flower heads are arranged along one side of the branching inflorescence. Leaves are simple, alternate, smooth edged or slightly toothed. Low growing species — less than a foot or so –typically have basal clusters of leaves and then small leaves which reduce in size up the stem. Tall growing species typically have many, mostly same sized, leaves up the stem, and no basal leaves. 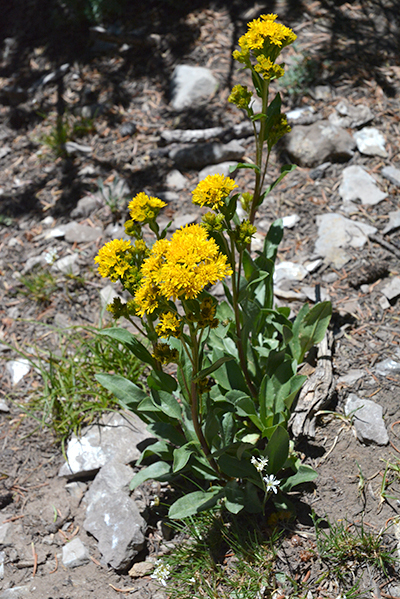 Rocky Mountain or Low Goldenrod – Solidago multiradiata – About 1-1.5’ tall, these tufted plants are often wedged into rocks or along sides of trails. Look for approx. 13+ ray flowers per head and ciliate hairs along the petioles of basal leaves. Low Goldenrod has “bursts” of flowers at the top, each head with many tiny ray flowers. Canada Goldenrod – Solidago canadensis – 2-3+’ tall stems with leaves of similar size. 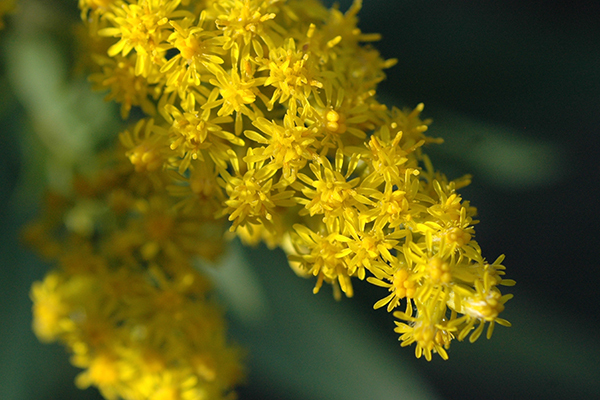 Canada goldenrod has pointed, 2-4” leaves with sharp teeth and three strong veins. 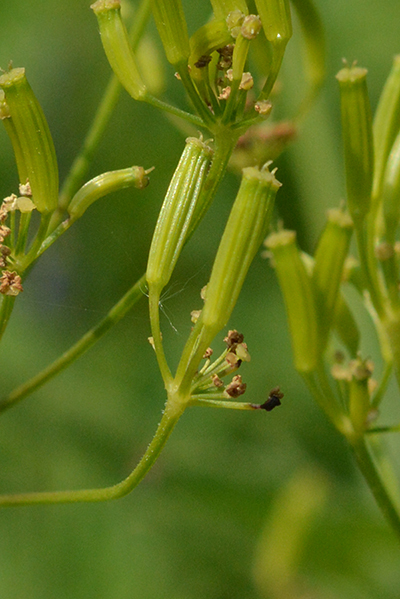 The tiny flowers are arranged along one side of the arching flower stems. The plant is finely rough hairy along much of its stem. Canada Goldenrod can look a bit like a tall groundsel, but the individual yellow flower heads are tiny. This family used to be called the Umbelliferae because the tiny flower are arranged at the ends of umbrella-like ribs—e.g. stalks arising from a central point. Each flower has 5-tiny petals and an interesting fruit that splits in two called a schizocarp. These fruits can be the key to identification and are fun to compare. 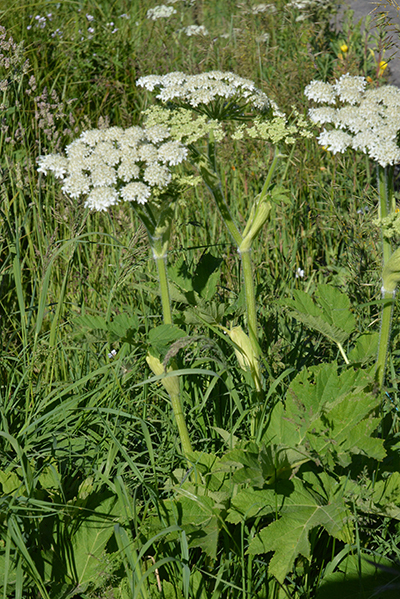 Cow parsnip – Haracleum spondyleum – This floral giant is hard to miss in moist areas and aspen groves: the flat flower clusters are the size of dinner plates. The inch thick stems are bristly hairy and the huge compound leaves are divided into three broad leaflets each with 3 pointed lobes. Overall the plants can be 4-5’+ tall. 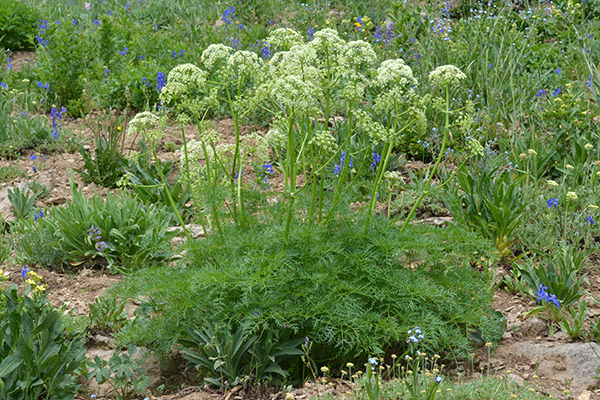 Fern-leaf Lovage – Ligusticum filicinum – The white flower clusters are salad-plate size and are held 1-2’ above large finely dissected leaves—reminiscent of giant carrot leaves. Fruits will be 1/4″ oblong schizocarps. Fernleaf Lomatium/Spring Parsley – Lomatium dissectum –Remember the large pale yellow spring parsley with fern-like leaves, similar to lovage, that bloomed in spring? Most of the plant has dried up, but the fruits are held up at eye height on umbrella ribs to disperse by wind or bird. Sweet Cicely or Western Sweetroot – Osmorhiza occidentalis – This 3’ species is the largest of three local members of this genus. Note few “umbrella” ribs compared to some other members of this family. The tiny yellow-green flowers have turned into inch-long, elongate, smooth fruits that taste a bit like licorice or anise. The elongate fruits of western sweet cicely have a tangy, anise flavor. Two other species can be hard to distinguish as both have elongate fruits with downward pointed hairs. Both are be found in shady, moist locations. Again it is just fun to observe and taste the differences! Note the stiff hairs, sharp tip of the fruit of this Sweet Cicely. The fruit will split and stick to clothes and fur. Sweet Cicely – O. berteroi/chiliensis – Flowers borne on approx 1.5 feet stalks which may stretch to 4’ high in fruit. The narrow, pointed fruits with stiff hairs attach to hikers and wildlife for dispersal. Bluntseed Sweetroot – O. depauperata – 10” or less tall with elongate, club-shaped fruit with a blunt tip held on wide spreading stalks. Bluntseed Sweetroot is most delicate. The club-shaped fruit with blunt ends are held at wide angles. 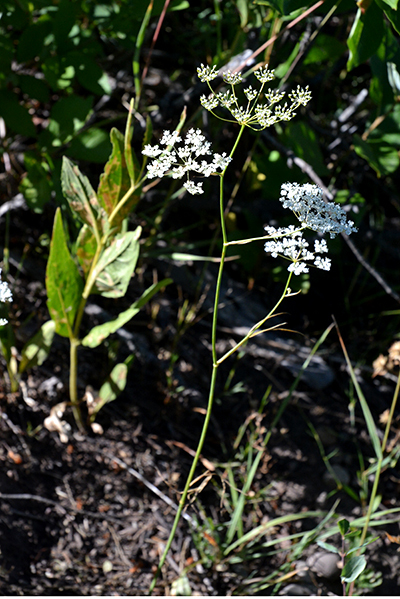 Common Yampa – Perideridia montana – Look for the tiered lacey white inflorescences 3-4” wide just beginning to bloom in sage flats and meadows. The leaves are very skimpy: only 1-3 on the 1-2’ bluish gray stems, each with maybe 4-5 pairs of linear leaflets that fizzel quickly. The swollen roots are relished by bears and other wildlife. Yampa root is cherished by bears, ground squirrels and even people. 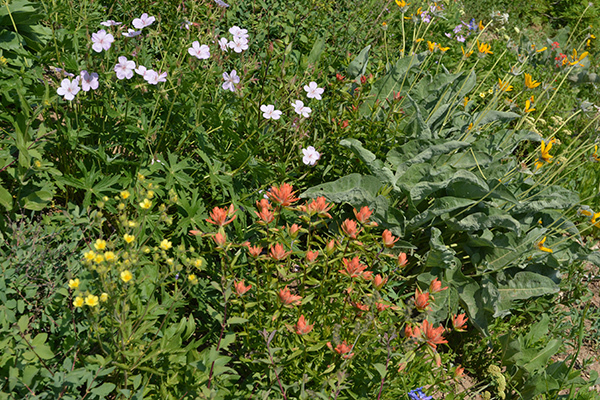 These are just a few wildflowers you may find while out hiking mid-summer. It is fun to try to recognize a plant family and compare its members’ flowers and fruits. Slowly, the plant varieties will become familiar friends, and with practice you may remember their names! In any case, you have had a good “conversation”. Note: Measurements are approximate. Using the scientific names you can look up precise details and more about each species. Also, there may be other look-alikes than are compared here.